For addicted globetrotter, Lara Peake, the bigger the adventure and the larger the culture shock the better. Lara has completed a whole bunch of Globetrotting rides in destinations the world over – read on to find out what keeps her coming back. How have horses influenced or changed your life? Riding has given me the opportunity to make new friends around the world and communicate without the English language. What is your earliest memory of horse/s? Riding in Scotland when I was secen on a very small black fluffy pony on a lead rein. I was very keen not to be lead. What was your childhood pony called? Supreme Elegance – I still have the felt pad I embroidered her name onto in silver thread. What does riding or being with horses mean to you? Patience. Loyalty. Responsibility. Balancing risk. What was your first Globetrotting ride? What made you take the plunge and sign up for a Globetrotting holiday? Fear that if I didn’t do it now then I might not be fit enough later to be able to escape a charging lion. Which Globetrotting rides have you since completed? Mongolia, Namibia, Okavango Delta and Japan. What is your most memorable Globetrotting moment? Why choose this type of travel? As in exploring a new country from the back of a horse? You become part of the landscape, melding all senses with those of your horse. And you reach areas otherwise impassable. 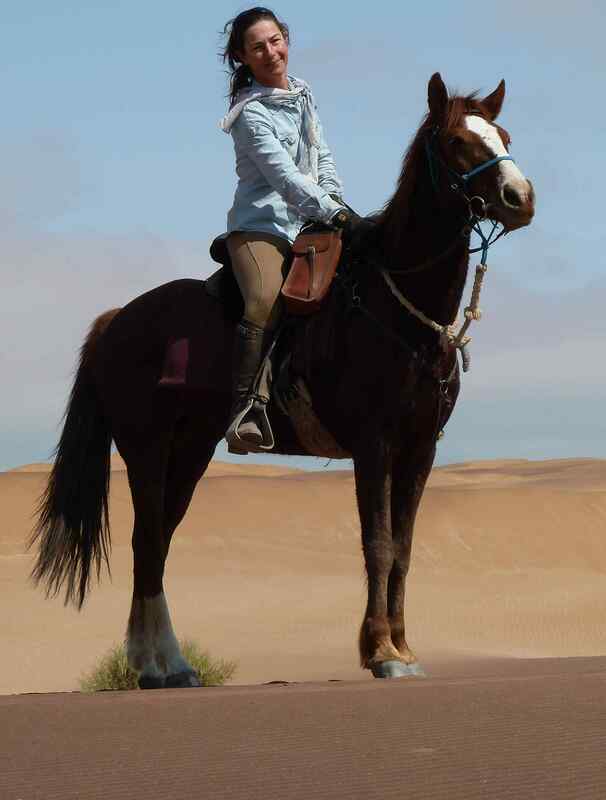 I have been carried through areas on horseback I could not have traversed on my own. Four legs are better than two. Who is your favourite safari horse of all time and why? Sanataria (pictured above) in Namibia, who was found running wild with the mountain zebras and as a consequence was tough, swift and surefooted. She belonged in the desert. Research and book a few extra days at the start or end of the trip to relax and recover and see the country you are in from a new perspective. Neocort – an anti-inflammatory, antibacterial and analgesic topical cream. It’s actually for animals but my vet uses it for herself, too. And then you can leave it behind for the horse you rode. Always a welcome farewell present.